When North America’s leading heavy-duty transit bus company unveiled a line of all-electric buses, one of the biggest obstacles was a lack of charging stations across the United States. While the line of buses had an efficient lithium-ion battery with a good range, they needed a cost-effective and mobile battery charging solution for remote locations. The idea was to develop a compact, operator-friendly charging station that could be deployed in locations that lacked charging infrastructure. But because their bus fleet was at the forefront of electric vehicle technology, there wasn’t an off-the-shelf charging station that would work for their desired application. They needed a fully customized power solution. CK Power and Girtz Industries partnered to tackle the problem head on, developing a first-in-class hybrid bus charging trailer tailored to the usability and efficiency requirements of the bus transit company. CK Power designed the hybrid diesel / battery power system, and Girtz Industries designed the user-friendly enclosure. From quote to design to delivery, the entire process took a mere four months. While the hurdles associated with developing a niche, custom power solution are sizeable, Girtz Industries and CK Power both came to the table with complementary skillsets, a can-do attitude and a team of highly qualified people. Together, they needed to find solutions to each of the primary design challenges of the project: Designing the unit for efficiency, complying with stringent Tier 4 Final emissions regulations and overcoming space constraints. This fleet of electric buses was built upon the concept of cleaner, greener transportation. The charging trailer CK Power and Girtz Industries designed needed to follow suit, providing power efficiently. To accomplish this, they powered their generator with one of the most fuel-efficient diesel engines on the market today: The Volvo Penta engine. Volvo’s advanced combustion technology (V-ACT) features a state-of-the-art engine management system that automatically adapts its engine performance to varying loads for optimal fuel economy — boosting efficiency by nearly 5%. And, because the system runs on diesel —the most efficient fuel source by volume— it’s the perfect source of power for a bus fleet designed for efficiency. The Environmental Protection Agency’s (EPA) Tier 4 Final regulations were put in place to reduce the emission of harmful pollutants like particulate matter (PM) and nitrogen oxide (NOx) from diesel engines. The Volvo Penta system produces low PM levels, but high NOx levels. To bring their NOx levels down, they have a two-part emission control system: Selective catalytic reduction (SCR) and exhaust gas recirculation (EGR). Through a chemical reaction with diesel exhaust fluid (DEF), the SCR system converts toxic NOx emissions into naturally occurring nitrogen and water. Then a percentage of the exhaust gas emitted from the SCR is circulated back into the combustion chamber — this is called EGR. EGR exchanges some oxygen for carbon dioxide in the combustion chamber, which results in less NOx being produced and a lower peak combustion temperature. Through EGR, fuel that would’ve otherwise been wasted becomes useful, driving the unit’s cooling needs down and efficiency up. Using the powerful Volvo Penta engine system as the basis of the custom-designed generator helped the trailer comply with strict Tier 4 regulations and boost the efficiency of the charging trailer as a whole. Girtz Industries, an equipment packager specializing in power packaging, led the charge on designing the enclosure. Everything required for the charging trailer to work —the generator, the battery charging unit, load cables, the 300-gallon fuel tank, the DEF tank and a radiator exhaust room— needed to fit in one 20-foot steel container. They used their Z-CUBE® ISO container —a durable, sound-attenuated steel container— as the starting point. Using 3D computer-aided design (CAD) technology, they determined the best way to fit the required components within the container. They separated the container into three rooms: A room in the back of the container housed the generator, the front room housed the battery charger and the radiator exhaust room was in the middle. Load cables ran through the walls connecting the generator to the battery charger and allowing power to flow from one to the other. And the DEF and fuel tanks were placed so that the user could easily fill them from the outside of the trailer, making the unit very operator-friendly. In the end, Girtz Industries and CK Power were able to house a battery charger and clean diesel generator in one, 20-foot container. The fuel-efficient diesel generator powers the battery charger, and the battery charger plugs directly into the bus. With about a 24-hour runtime without refueling, the unit is perfect for providing a charge to buses in isolated locations without immediate access to fuel. Creating a leading-edge technology doesn’t happen by chance. It takes a strong partnership, a commitment to excellence and a team of innovative engineers. Girtz Industries and CK Power have all three. The two family-owned companies came together with a shared passion for providing an excellent product and ended up developing a custom power solution exactly matching the needs of the application. 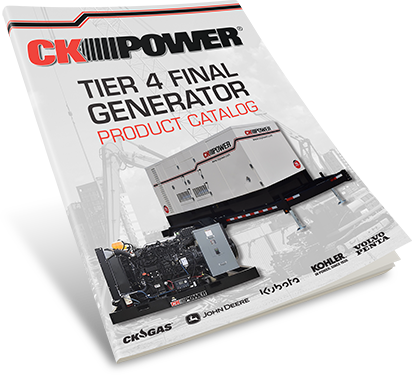 CK Power provides a full portfolio of reliable, efficient Tier 4 Final generators. But we also have the right people and the right partnerships to develop any solution — no matter how custom or niche. We pride ourselves on developing high-quality custom solutions with quick turnarounds. Check out our brochure of standard Tier 4 generators. Or, if you don’t see what you need, talk to us about developing an all-new solution to your power problems.